Well looking back at the beginning of the photo quest, back in 2007, it seems to have taken me a few weeks before I did my first British beer tasting. Anyway here are three of the earliest beers I took photos of. Of course just in case you didn't know, these are my first beer photos not my first beers. Saying that, it is only a few years longer than this, that I have been trying new beers in earnest, before this I just drank whatever there was on offer and that was usually northern beers. 5.2% dark colour with a very good head, malty and hoppy aroma, malty yeast taste. 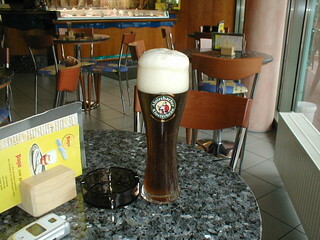 Drank in Bad Liebenzell in the Black Forest of Germany. Looks like a good pint of draught Camerons Strongarm and although it was slightly watery than the Strongarm, it was quite good. 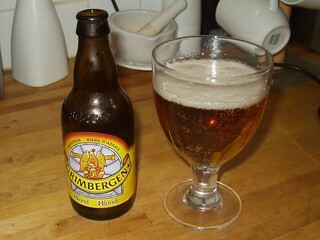 5.2% golden colour with a thin head, slight malt aroma and taste, slightly over carbonated for my taste but refreshing. 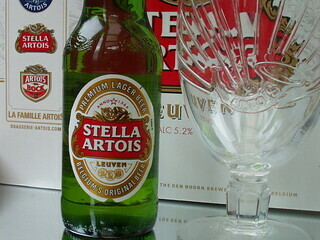 A present from my brother Mick, I am a beer man through and through but I think Stella Artois has been getting a lot of bad comments lately. For what the English call a lager, its not one of the of the worst, in fact it is one of the better ones, speaking as a beer drinker anyway.